OK, so maybe that's a little bit of an exaggeration. But part of what's been fun about watching this team this season -- and trust me, I wasn't so sure I'd ever consider watching the Mariners "fun" this season -- is that every game seems so big. It seems like they're always on the verge of either becoming a serious threat in the AL West or becoming the also-ran we've grown so accustomed to over the past three years. Accordingly, the M's face yet another one of these crossroads tonight: Win, and you're 3 1/2 games back; lose, and you're 5 1/2 games back. It's only two games, but two games is a huge difference. Think of it this way. Let's say the M's take advantage of the upcoming soft spot in the schedule that features Texas, Baltimore, the Cubs, Houston, Pittsburgh and Cincinnati (with a series against San Diego and another singleton against Cleveland mixed in) and play .609 ball over those 23 games to go 14-9 before Boston comes to town on June 25. I think that's a reasonable proposition. Under a 3 1/2-game deficit scenario, Los Angeles would have to go 10-12 over that same span for the M's to tie the Angels for first. If they're 5 1/2 back? The Angels have to go 8-14. Again, that's just to manage a tie. Don't forget, the Angels have played .600 ball so far this season -- including winning 15 of their past 20 -- and also play such juggernauts as Baltimore, St. Louis, Cincinnati, Houston and Pittsburgh over those 22 games. That's why sometimes teams make up only one game in a whole month. Some people thought I was overreacting when I said the M's really needed to sweep this series, but fans often don't recognize just how hard it is to make up games on a team. They see a 4- to 6-game deficit and think, "That's totally doable." But at just 4 1/2 back today, the M's chances of making the playoffs stand at just 16.5 percent -- or, roughly, a 6-to-1 longshot, pretty much what it's been all year. 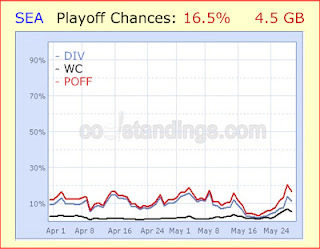 (Thanks, coolstandings.com, for the graphs to the left.) 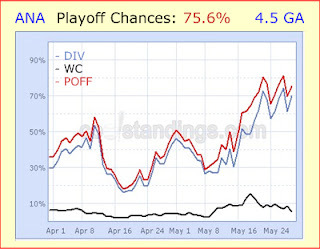 Conversely, check out the Angels' playoff chances with "just" a 4 1/2-game lead, right below that. Do I like the Mariners' chances tonight? Of course I do -- with Felix on the hill, I like their chances against anyone. I especially like the idea of a pitching confrontation with Vlad Guerrero that will somewhat resemble a fair fight. I didn't much like a lot of what I saw out of the offense last night, however. The Mariners' hitters' lack of patience is well documented, and while it appeared they had a solid approach in the first inning, that approach was quickly abandoned the second time through the order as the hitters pressed to make something happen. Having a plan and sticking to it is the mark of a excellent offensive baseball team, and that will be necessary again tonight against Jered Weaver. Good Weaver hasn't been nearly as spectacular as he was when he burst onto the scene last year, as injuries have again thrown a bump into his season. While his strikeout rate is higher than it was last year, his strikeouts to walks is way down. He's also giving up a lot more hits than last year, many of them the line drive variety. If the M's go up to bat with a plan to be patient -- and actually stick to the plan -- Weaver's stats tell us they'll get some walks and likely get a pitch they can drive. It should be fun to watch. I was glued to the TV last night, even as it became apparent the Mariners had no answer for Santana and weren't likely to have one for Scot Shields or Frankie Rodriguez, either. And that's as telling as anything: For the first time in three years, I'm actually having fun as a Mariners fan. I'm not going to say last night was a game the M's should have won, but it's a game they certainly could have won. But rather than get too wrapped up in what could have been -- or too upset -- I'll say this: Last night's game struck me as the kind of game that happens to a baseball team over the course of a 162-game season, the kind of game where you just get exceedingly unlucky and it's the difference between scoring one run and four or five runs. Think about it -- Johjima's double play in the first inning that ricochets off the pitcher's mound right to the second baseman; Quinlan's diving stab of Guillen's rocket down the left field line; Ichiro losing a flyball in the twilight sky; numerous other hard hit balls being hit right at defenders. It's just unfortunate that it came in such an important game against the division leaders. Loved what I saw out of Ryan Feierabend. He was one Ichiro misplay, one mistake pitch -- what in the world were he and Johjima thinking throwing a third consecutive fastball to a dead-red fastball hitter? -- and one boneheaded decision by Adrian Beltre (should have thrown to the plate in the 5th) from giving up just one run last night. He clearly is not a finished product, but that change-up is a major league-quality pitch right now. Dave Cameron over at U.S.S. Mariner said he reminds him of Jarrod Washburn, but he actually reminds me a little of a poor man's Cole Hamels with that change-up. He needs to locate that fastball better to be consistently effective in the bigs, and that curve could be a heck of a lot better if he'd get a little more downward action on it, but he pretty clearly represents an immediate upgrade over Jeff Weaver and Horacio Ramirez. If the M's are comfortable with him working on that fastball at the major league level, he should stay in the rotation. HoRam's $2.5 million salary isn't prohibitive, and he does have options left. Mike Hargrove was non-comittal after the game, and Times writer Geoff Baker speculates it hinges on convincing Weaver to make a couple of rehab starts at AAA. After watching Raul Ibanez's debacle of a first inning in left field -- in which he made a comically pathetic slide as an imminently catchable dying line drive fell harmlessly in front of him, then he made another comically pathetic throw to home plate -- and subsequently watching Jose Guillen hold Willits to a single in the third on that ball down the right field line, someone please explain to me why Jason Ellison always comes in to replace GUILLEN in the ninth inning? And while we're at it, why are we not seriously considering adding Adam Jones to this roster, despite the fact that Jones is right handed? I have to think that any damage exploited by lefty-righty matchups against Jones -- who is hitting .304 at AAA and hit two more home runs last night to give him nine on the season -- would be overcome by the runs he saves in the outfield. The only other successful scenario I see for the M's making the playoffs is if they match the Angels win for win the rest of the way except when they play head to head. Then the M's must win each of the remaining series by a 7-3 or 8-2 margin. Of course, I don't like these odds either. However, head to head is always the way to take it away--makes the victory ever more sweet. By the way, today it dawned on a student what a Mariner is. He looked absolutely amazed when he found out. Pretty funny because he's been a fan since birth. The problem is that they keep losing games to the Angels. They put up a heck of a fight tonight, but barring a ninth-inning comeback, they're not going to get it done -- and that's all that really matters, isn't it? If they had gotten even a halfway reasonable start from Felix, we'd be celebrating right now.